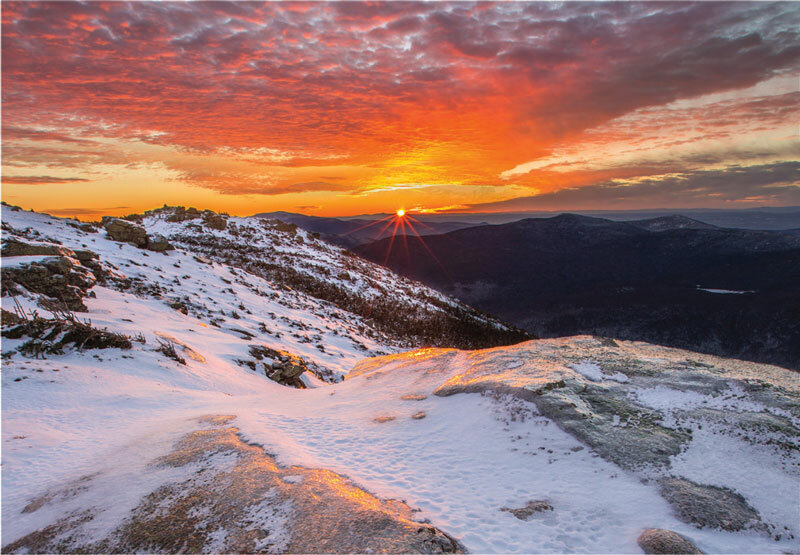 Mowglis alumnus and photographer Chris Whiton (’84) has been capturing the breathtaking beauty of the White Mountains for many years—first on film, then with digital. His love of photography stemmed from his long involvement with oil painting. He found that he got the same joy out of painting with light as he did out of the magic of painting with brush on canvas. An avid hiker from an early age, Chris draws inspiration from his love of the grand wilderness in New Hampshire. His grandfather and grandmother were pioneer trail-blazers, living on the top of Mount Cardigan, while his uncle was a world-traveling professional photographer, and his cousin is a well-known photographer, painter, and landscape artist. Growing up in such a family, Chris naturally fused his love for the outdoors with an eye for natural beauty. The New England wilderness offers unique opportunities to capture breathtaking vistas. The challenge for the photographer is to see each scene anew and find unique ways to capture the raw beauty and dramatic contrasts of New Hampshire’s landscapes on film. Chris lives with his family in Bethlehem, New Hampshire. A cold January afternoon looked perfect for a trip to Franconia Ridge. Headed up with a good friend and stayed on the summit of Little Haystack until sunset. The colors were phenomenal, and we were in the perfect place to witness it. Had a great snowshoe swoop down Falling Waters Trail in the dark. Each autumn I take a trip to Dixville Notch in the far north end of the state to do a loop hike over the craggy peaks of the area. On this particular day, I was running late and made the summit of Table Rock, 800 feet above the notch, just right as the sun started to set. The filtered light brought out all of the reds in the trees, seeming to set them on fire. Took several shots and then headed down the steep trail by headlamp. Every spring, the fields of Sugar Hill are swamped with photographers, all looking for that classic shot. Early on a Tuesday morning, I had the field to myself and caught this gem. A photographer friend and I were headed up the Ammonoosuc Ravine Trail to take sunset shots from the Lakes-of-the-Clouds Hhut. Sunset was a bust, but the frozen water at Gem Pool more than made up for that it. Hiked up to Madison Spring Hut in the dark on one warm August morning, hoping for some good light on my favorite lake in the White Mountains. The sunrise did not disappoint. As the birds chirped, and the warm yellow glow painted the side of Mount Adams over the water, I knew this was one of those moments I would always remember.